Mentors are over-utilized, under-trained and, as studies show, under-deliver. From an employer's perspective, assigning a mentor is often a band-aid to a larger problem. From an employee's perspective, a lack of formal mentorship is seen as a serious, career-inhibiting problem, the equivalent of sailing a boat without a rudder. In The Mentor Myth, Debby Carreau represents this dichotomy, explaining that while a mentor's counsel can be invaluable, it is not the silver bullet human resources professionals often purport it to be. The opinions of a mentor are one data point, one piece in the much more complex game of navigating a career. In fact, the increasing overreliance on mentorship can actually be a hindrance to a successful career. Instead of continually looking outward for career guidance, aspiring professionals must realize that they possess all the tools necessary to take control of their own careers by using their own strengths, capabilities, and visions of success. 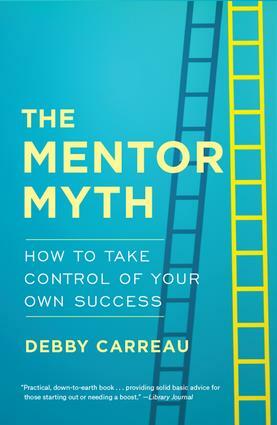 Through her years of experience consulting, speaking, and writing about career development, Debby has created a comprehensive, easy-to-implement guide for taking ownership of your professional success. Debby begins by helping the reader create a professional roadmap, including how to build a personal brand, project the right amount of confidence, and manage time. She addresses mentors in the context of networks and sponsors, advising the reader how to incorporate outward influences rather than be defined by them.